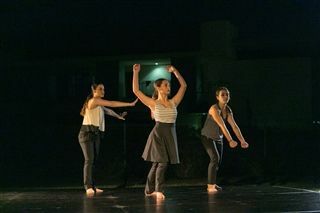 On Friday, January 27, Windward performing arts showcased its young talented artists at its annual dance performance, An Evening of Dance: The Multimedia Project, which took place in multiple locations on Windward's campus. The performance included Windward Dance Company in choreography by Genna Moroni of Ate 9, Gustavo Ramirez Sansano of Luna Negra, Leslie Scott of BodyArt Dance, and Laura Berg and Gracie Whyte Coad of WHYTEBERG with a preview performance by WRED choreographed by Yusha Sorzano and a special guest performance choreographed by Andrew Winghart. 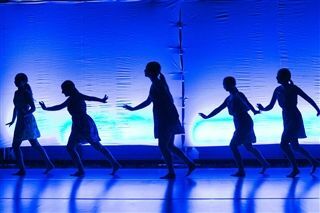 Click here to view photos from the evening's performance. The full evening, but particularly the work experienced outdoors moving from the stairwell to the walkway and grass, across the beautifully constructed new bridge, and into the gym, was intended to challenge and present fresh perspectives on how we view dance; viewing art not through passive engagement, but active participation. "Our greatest hope is that you found a moment in the work that engaged and inspired you; one worthy of conversation and celebration of the dancer's commitment to risk taking and exploration," said Dance Program Area Head, Alesia Young.